17 ways to get more creative this weekend. We’re always here for a DIY, especially one that results in a decorative accent piece—as well as one that doesn’t break the bank. And regardless of where you fall on the DIY-pro scale, we’re sure that there is a project out there you can easily tackle. The theme here? Silicone molds: a surprisingly versatile tool which allows you to craft with materials ranging from putty to edibles, and everything else in between. Read on to see the colorfully-charged DIYs we’ll be making this weekend. Impart your desktop with a bold pop of color, courtesy of this easy DIY. Use the geode-shaped molds and craft painted-plaster to recreate these colorful gems that double as mini-snapshot holders. Get the how-to on A Kalio Chic Life. Pair your favorite cereal with a bit of milk and ice cream (naturally) and freeze! That’s our idea of a good breakfast. Get the how-to on Paper & Stitch. Recreate these mini candy donuts with silicone donut molds and chocolate or butterscotch candy melts. Add a touch of summer to the fridge with these vibrantly colorful magnets. Get the how-to on Homey Oh My. When paired with water, the citric acid and baking soda combo that make up these fizzies create bubbles in the bath! Get the how-to on MarthaStewart.com. 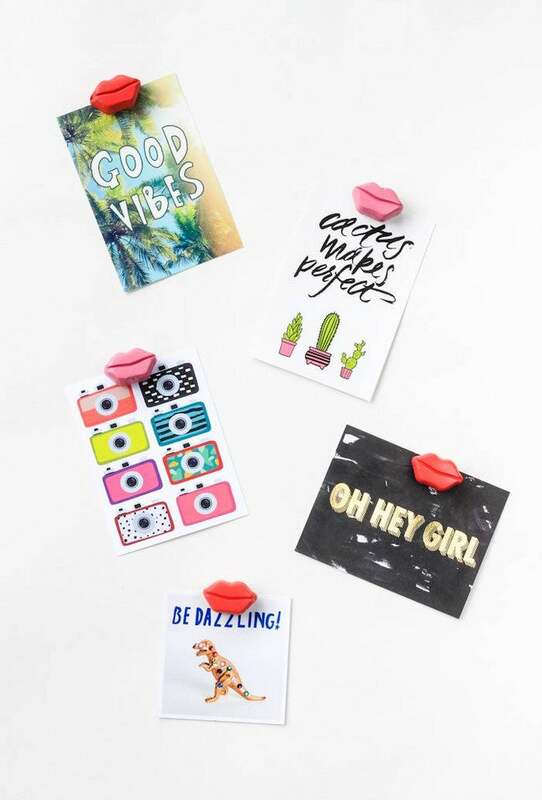 Add a pop of color to wall art displays and desk side memos with these cheeky magnets. Get the how-to on The Crafted Life. Serve these sweet treats up (we couldn’t help it) at your next brunch or cocktail party with a side of bubbly. Crush up Jolly Ranchers and bake in silicone molds until the candy has melted into a delicious lollipop form! Star Wars fans rejoice! Here’s your chance to bring in a piece of the galaxy into your home. Get the how-to on Buzzfeed. These boozy jello shots contain a milky base and a whipped cream garnish with some sprinkles! Get the how-to on A Beautiful Mess. A teeny version of the very adorable children’s toy you can make at home! Get the how-to on Natalme. Resin and glitter come together to create this ultra playful statement jewelry. Chocolate becomes art with these edible gold foil topped pyramids! There’s a new way to display those polaroids with a simple DIY featuring quick dry cement and a pop of neon. Bonus points for witty phrases! Get the how-to on I Spy DIY. A summer-friendly alternative to the cocktail – these refreshing popsicles feature a deliciously spicy kick. Get the how-to on Honestly Yum. These two-toned copper votives will make the perfect addition to the coffee table or outdoor setup. Game night just got a whole lot better with these ultra cute dominoes crafted with quick-dry cement and paint! Get the how-to on Lovely Indeed. This story was originally published on April 12, 2016, it has been updated with new information.